At first glance, the idea of setting stories of horror and the supernatural in schools will either evoke memories of Buffy or lead the reader to expect nasty, scary things to be happening to school age children. In fact, very few of these stories involve children (readers may either be disappointed of relieved). Many of the authors who were invited to contribute to this anthology are writing supernatural series of their own and have sent their adult characters on training courses or to seminars – after all, we never stop learning. All the contributors are American writers so this book will have appeal in two areas. Those familiar with the series to which the characters in these stories are related will want another episode in their histories; others will come to this volume looking for a wide ranging set of stories connecting learning with horror or the supernatural. It is also worth remembering that the structure of the American school system is different from here. Many readers will be familiar with Charlaine Harris’s Sookie Stackhouse series, either from the books or the True Blood TV series. In ‘Playing Possum’, Sookie has promised to take cakes to the school of her cousin’s son, Hunter, for the Labor Day party. Somehow, mayhem follows her around as her arrival coincides with that of the irate boyfriend of the school secretary. 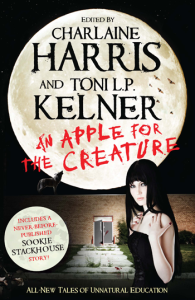 Sookie’s telepathy comes in useful in resolving the situation but the monster is merely a violent red-neck unaccustomed to being dumped and who thinks killing the offender is a reasonable approach. School for many can be a nightmare, especially for those that don’t fit into a perceived group. While in Harris’s story an ordinary school day turns in to one, for the narrator of ‘Low School’ by Rhys Bowen, the nightmare is where it starts. We have all had those anxiety dreams about being late for an exam or being unable to answer a single question on a paper. That is the kind of day, the narrator is having and to be waylaid by the class bullies as well doesn’t make things easier. While an entertaining story, with small twists at the end it was evident fairly early on where this one was going. ‘Spellcaster 2.0’ by Jonathan Maberry is one of the few stories that doesn’t seem to have a series at the heart of it. The main characters are students at a university and are involves in a project to record all the ancient spells they can as a searchable database. Without meaning to their actions actually complete a spell and they conjure a demon. It is very reminiscent of the Stephen King short story ‘The Mangler’ in the way it comes together. Though the circumstances are very different, it shows the power of convergent thought processes. Another of the unassociated stories is ‘VSI by Nancy Holder’ but this time in, like another of those in this volume, the classroom is a training programme for those already doing the job but need to learn a different aspect of it. In this case the trainees are a group of professional cops who are being trained to be part of a special task force that is being developed to deal with crimes that have a supernatural element. ‘Academy Field Trip’ by Donald Harstead has a very similar set-up but with different approached and different outcomes for the main characters. Of the two, the Holder is the stronger story. ‘Sympathy For The Bones’ by Marjorie M. Liu stands out as being different from other stories as the world in which it is set is unlike ours having a low level of technology. The main character doesn’t go to school as such but is tutored in witchcraft on a one to one basis, specifically in the making of poppets – voodoo dolls that can be used to inflict pain and death on wrongdoers. 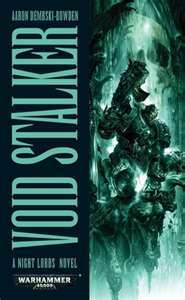 Then we come to the group whose protagonists will be familiar to a number of readers who pick up this volume. The Callie in ‘Callie Meets Happy’ by Amber Benson is Calliope Reaper-Jones who runs Death, Inc. her problem is that she is unable to call up the wormholes she needs to take her to anywhere on the planet. As her underlings can all do it she feels a fraud asking them to create the wormholes for her. As a result, she is attending an Adult Education class for the purpose of learning the technique. Only readers familiar with Callie’s history will know where this story falls within the sequence. 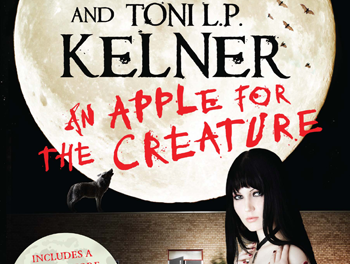 ‘Golden Delicious’ by Faith Hunter also falls into an extant Skinwalker sequence of supernatural novels. They feature Rick, an ex-cop who was bitten by a werewolf, Brute, a werewolf no longer able to take human form and Pea, a supernatural creature called a grindylow. They have to learn to work as a team and Soul is their tutor. This story forms part of their training. The task they have to solve is to find the cause of some very nasty murders. They can only do this if they can put differences aside and work together as a team. ‘Magic Tests’ by Ilona Andrews is another that is part of a sequence and fits between two novels of the sequence. This time though the series is aimed at a Young Adult audience and the main character is Julie Olsen who is still young enough to need to attend school. This is very convenient because she is able to go undercover to try to find a student who has disappeared. Those at this particular school have talents which could be classified as supernatural. As a newcomer to the characters and their world, I found some aspects very familiar but liked the resolution. ‘The Bad Hour’ by Thomas E. Sniegoski also slots into a series that some readers will be familiar with. This time, the school is an obedience school dogs. Remy Chandler is a seraphim who works as a PI. He is able to talk to his dog Marlowe so when the owner of the school comes to him in distress, Marlowe is enrolled, much to his disgust, to enable them to investigate without it appearing that anything sinister is going on. While most of these stories have a supernatural element Mike Carey puts a very Science fiction spin on his story ‘Imphigenia In Aulis’. Melanie is a youngster who attends school securely fastened to a wheelchair. She or her fellow classmates are not disabled but the staff are very scared of them. Slowly, Melanie begins to unpick the reasons for her situation. While many would prefer to see them dead, they have become victims of a loophole in the law. To say more would give the plot away and this is a very cleverly constructed and told story, perhaps the best in this volume. Not all those in an educational system are students. ‘An Introduction To Jewish Myth And Mysticism’ by Steve Hockensmith deals exclusively with the teachers. When Robert Ramsey returns to the campus after a year’s sabbatical, his ex-wife, Karen is scared he will return to the behaviour that made her leave him. She turns to a colleague, Andy Abrams, for help. Abrams tells to go away for the weekend while he tries to think of something. Abrams appears to be a timid, ineffectual man but his resolution comes straight out of Jewish mythology. This is a story with a sense of humour. ‘Pirate Dave And The Captain’s Ghost’ by Tom L.P.Kelner is another story with a light touch. Joyce is a relatively newly minted werewolf who has been invited to a week-long seminar to disseminate ‘pack wisdom’. Since she doesn’t belong to a pack, she is looking forward to running with other werewolves, that is until a ghost begins haunting her. The range of stories in this volume shows the variety of interpretations that can be put on the word ‘classroom’. Although nothing is intrinsically wrong with any of them many would be appreciated better by the American audience that has spawned them. Since the education system is so different in the UK, it would be interesting to see what the British horror writers would make of the same theme. I suspect that the volume would have a very different flavour.